Dr Dave, M.D. : Smoking ban in NC associated with fewer heart attacks? Smoking ban in NC associated with fewer heart attacks? In the beginning of 2010, North Carolina instituted a ban on smoking in bars and restaurants. The NC Division of Public Health has just announced data indicating that in the time period right after starting the ban, ER visits for heart attacks dropped by 21%. Many headlines only picked up on that top talking point from the press release, but some news outlets delved a little deeper into the complexities of the statistics. Taking a look at the report, it is interesting to note that ER visits were already on the decline in NC for the two years prior to the ban. That trend could be part of the reason for the continued decline. By raw numbers, the number of heart attacks in women actually went up. Dr. Siegel from Boston University goes into analysis in greater detail and has concerns about the conclusions drawn from this particular statistical analysis. 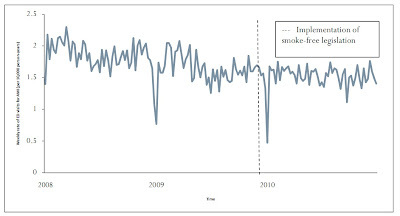 So while perhaps this evidence from NC is not the strongest with regard to smoke-free legislation, a large, recently published, meta-analysis found a pooled risk reduction of about 10%, but they also admit that the data is heterogeneous. 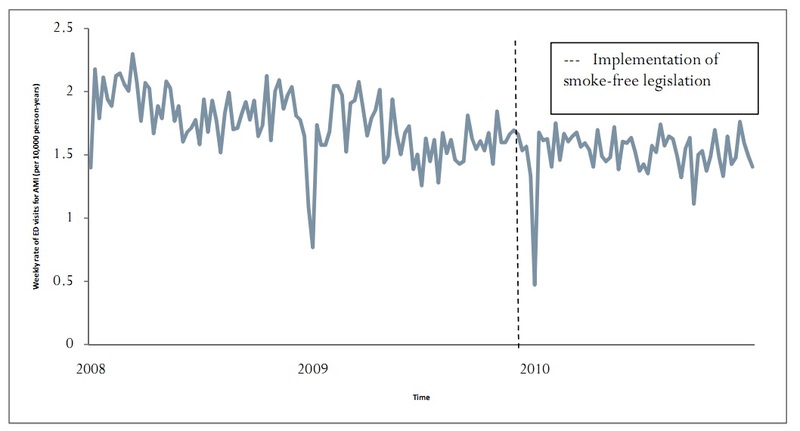 Regardless, seeing as how cardiovascular disease is still the number one killer in the US, a 10% reduction is strong evidence in favor of widespread adoption of smoke-free legislation. Ed note (11/22/11): another link about tobacco control legislation and its effects from the National Conference of State Legislatures including a US map of where you can find smoking bans.